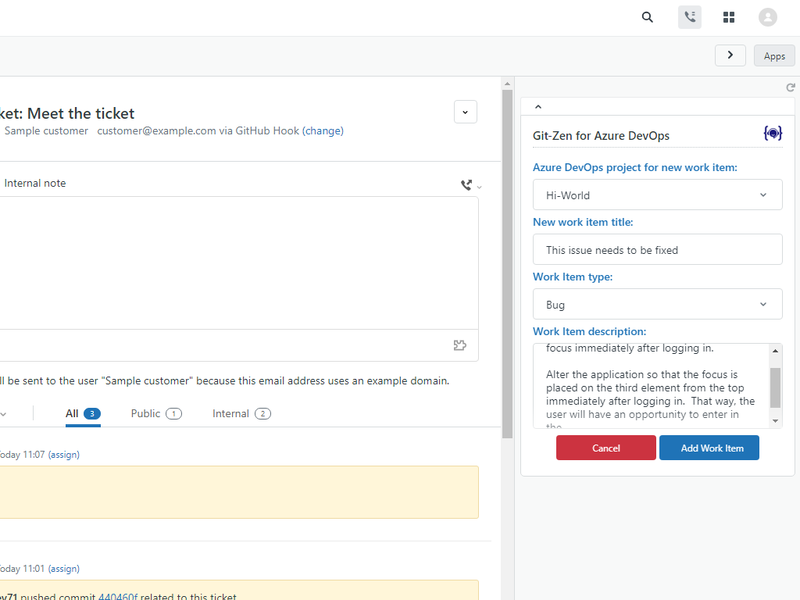 Git-Zen is a simple yet powerful Azure DevOps integration application for Zendesk. 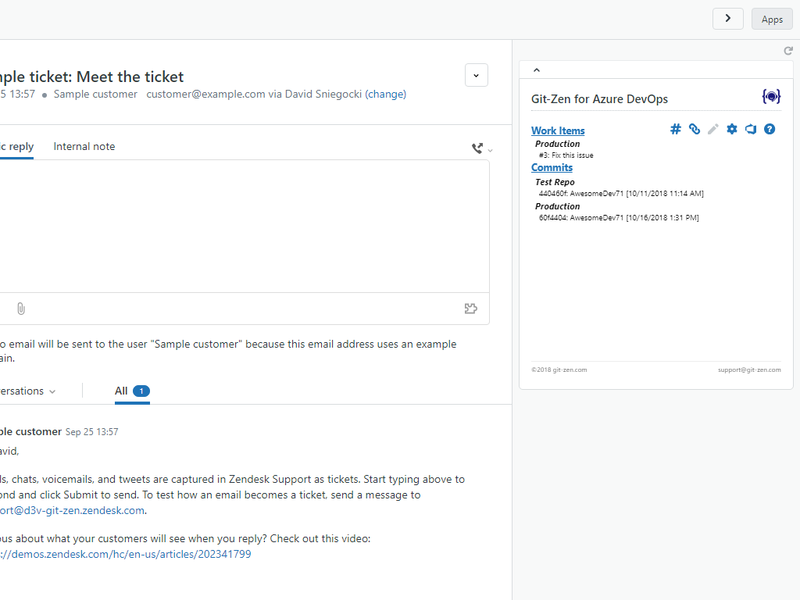 Git-Zen coordinates your Zendesk tickets with your Azure DevOps commits and work items. When a Zendesk ticket arrives, and code needs to be changed to correct the issue, you can now easily see which commits were made to correct the issue right next to the ticket. Git-Zen makes it easy to look at past tickets and see exactly what code was changed to correct the issue, in case further troubleshooting is needed in the future. 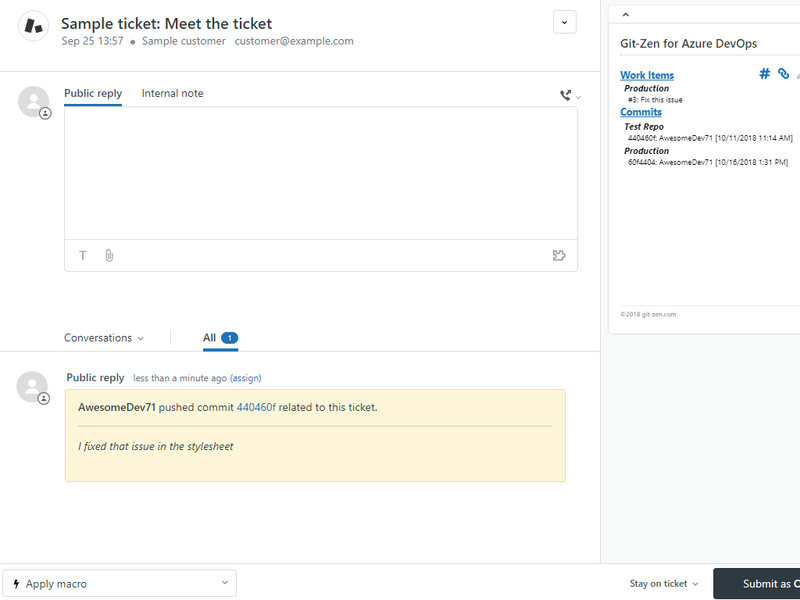 Git-Zen can also keep your agents separate from your developers, so that you do not need to have Zendesk licenses for your development staff; simply create a new Azure DevOps work item related to the Zendesk ticket directly from within Zendesk. See a list of related work items and commits right next to the ticket. Click on a commit link to view the commit in Azure DevOps. Create a new work item, link an existing work item, and comment on a work item right from within the Zendesk ticket. Multiple tickets can be referenced in the same commit comment or work item. Multiple repositories can be referenced; so if a change was required to both your database schema and your web application, all of the changes will be listed together. Enjoy the full feature set for less than $20 a month (cost is per Zendesk domain account; Git-Zen offers an unlimited number of users with each account). Contact us at support@git-zen for more information. You may add more than one ticket number in the same commit (or work item) comment; both tickets will have the commit (or work item) added to it in Git-Zen. You may add commits from different repositories to the same ticket; this is especially useful when a solution to a ticket is spread across multiple projects, such as a when a change is required to both a database schema and a web application in order to solve an work item. For more detailed installation instructions, please visit our website.